Scientists have overcome many live cell imaging challenges using advanced techniques such as TIRF, confocal, FRET, photo activation and microinjection. At the center of all this is the ECLIPSE Ti, a powerful system that provides instant access to all these methods plus revolutionary Nikon CFI60 optics. 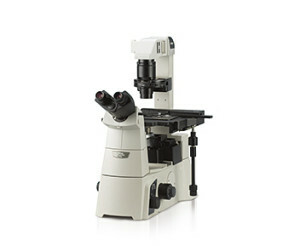 Available in three models, the Ti series offers improved system speeds, increased flexibility and efficient multi-mode microscopy as part of a fully-integrated microscope system that is ideal for high-end research and live cell imaging. The Ti-E comes with a unique Perfect Focus System (PFS) that automatically corrects focus drift in real time during a prolonged period of time-lapse imaging. By now employing 870nm wavelength for the coverglass interface detection, near-infrared fluorescence dyes including Cy5.5 can be used. Nikon offers two PFS models, one for UV-visible wavelength imaging and one for multiphoton imaging. The multiphoton model can correct for focus drift even when imaging with wavelengths ranging from 880-1300 nm. The revolutionary external phase contrast unit incorporates a phase ring and allows the use of high NA objective lenses without a phase ring for phase contrast observation. Because there is no light loss due to a phase ring, bright “full intensity” fluorescence images as well as high-resolution phase contrast images can be captured using the same objective lens.